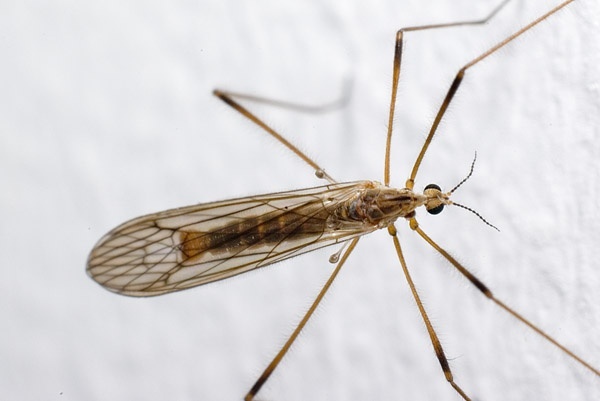 Crane fly is a common name referring to any member of the family Tipulidae of insects in the order Diptera, true flies in the superfamily Tipuloidea. Cylindrotominae, Limoniinae, and Pediciinae have been ranked as subfamilies of Tipulidae by most authors though occasionally elevated to family rank. In the most recent classifications, only Pediciidae is now ranked as a separate family, due to considerations of paraphyly. They are also known as daddy-long-legs around the world, not to be confused with daddy-long-legs that refers to arachnids of the order Opiliones or the family Pholcidae. The larvae of crane flies are known commonly as leatherjackets. The Tipulidae sensu lato is one of the largest groups of flies, including over 15,000 species and subspecies in 525 genera and subgenera. Most crane flies were described by the entomologist Charles Paul Alexander, a fly specialist, in over 1000 research publications.